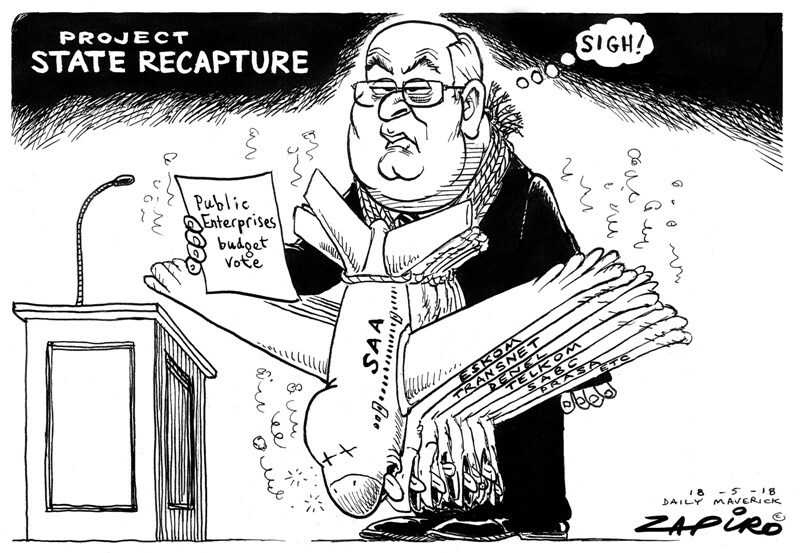 Pravin’s State Recapture Project. More of Zapiro’s brilliant work available at www.zapiro.com. How delightfully ironic South Africa’s political and economic scene can sometimes be. Barely a few weeks after all those “white monopoly capitalists” who supposedly run our banks warned that the plans of the African National Congress (ANC) to confiscate land might jeopardise some R133 billion in loans to the agricultural sector, the public enterprises minister, Pravin Gordhan, sounded a clarion call to those same banks to help him stave off bankruptcy at state-owned enterprises. If the banks are so indelicate as to raise the threat of expropriation without compensation (EWC) with him, what will Mr Gordhan tell them? That EWC is merely an electoral ploy to steal the thunder of the Economic Freedom Fighters? That it is part of Cyril Ramaphosa’s “long game” to consolidate himself in power before he embarks upon reforms to stimulate investment? Either way, he will probably tell the bankers, with a nudge and a wink, it should not be taken too seriously. They would be unwise to take any of this at face value. Firstly, as President Ramaphosa yet again made clear six weeks ago, the decision to expropriate without compensation has already been taken. The only issue to be resolved is whether this can be done without a constitutional amendment – something that may have to be decided via a court case. Secondly, although the mandate of the parliamentary committee reviewing the property clauses of the Constitution is confined to land, that does not exclude subsequent amendments which extend EWC to other property. The Constitution already states that “property is not limited to land”. So confiscating land will probably be the thin end of the wedge. This raises the question of the banks themselves. In a statement last week on the 63rd anniversary of the signature of the Freedom Charter, the ANC called on the government to redouble its efforts to realise “the wishes of our people” as guided by the charter. This may be little more than rhetoric for the occasion. That is how most members of the commentariat will view it. But the Charter says that “all the land” should be “re-divided amongst those who work it”. EWC is supposedly a means to this end. Another provision is that “the mineral wealth beneath the soil” should be transferred “to the ownership of the people as a whole”. This happened with the nationalisation of mineral resources in 2004. Using the impossible demands of the latest version of the mining charter to induce foreign mining companies to sell to a local state mining company is a logical next step. 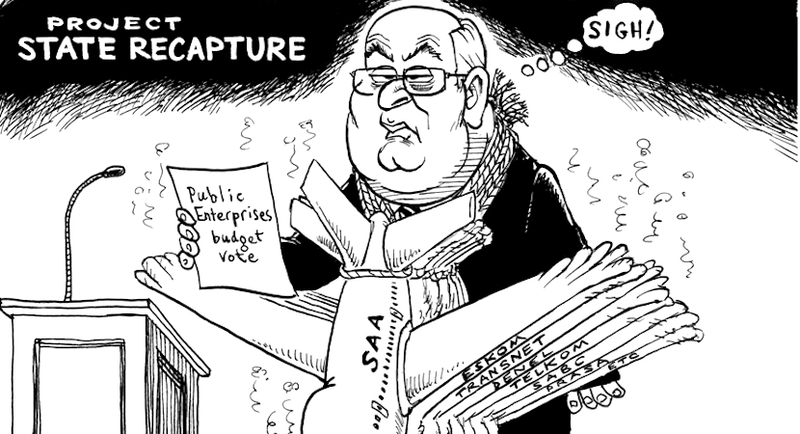 The Freedom Charter also says that “the banks and monopoly industry” should be transferred to public ownership. The South African Communist Party (SACP), principal architect of the Freedom Charter, has long taken the view that “transformation of the financial sector and redirecting its resources towards the productive economy” is key to “our struggle for industrialisation and investment in infrastructure”. Both the ANC and the SACP have all along tempered pursuit of their ideological goals with beguiling pragmatic tactics. They will no doubt continue to do so. Tactical retreats are permissible as long as the strategic goal remains intact. As the minister of trade and industry, Rob Davies, remarked last year, “radical economic transformation is a marathon, not a sprint”. Contrary to what business and the print media think, that is the “long game” that is actually being played. This incremental strategy allows you to set anxious minds at rest by donning pragmatic clothes whenever necessary. Mr Ramaphosa has done this by promising that expropriation without compensation will not damage food production. Mr Gordhan will don his smartest pragmatic garments when he talks to the banks about fixing the SOEs. The banks would nevertheless be wise to drive the hardest bargain they can. For a start, they could require unambiguous guarantees from both the Cabinet and the ANC that there will be no constitutional amendment to empower the government to expropriate any property without compensation. These guarantees should be incorporated in formal resolutions and made public so that reneging becomes that much more difficult. John Kane-Berman is a policy fellow at the IRR, a think-tank that promotes political and economic freedom. If you agree with what you have just read then click here or SMS your name to 32823.